I love seeing creative marketing ideas – online and off. When it’s a combination of two of my favorite things – Foursquare and dogs – I get even more geeked. 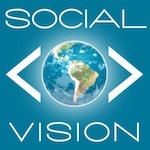 Check out this awesome use of Foursquare by the German dog food manufacturer, GranataPet! 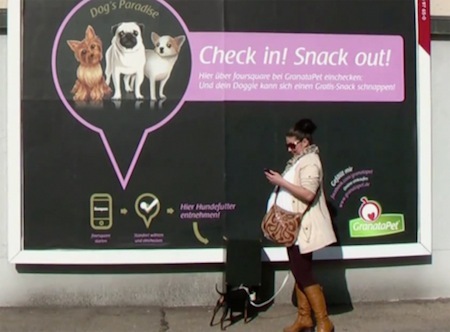 With the GranataPet SnackCheck, a passerby can use Foursquare to check-in to the billboard (yes, the billboard), and a small door opens to dispense a treat for your pooch. How does it work? The billboard instillation is powered by an integration with the Foursquare API. The check-in then signals a small black box to dispense a treat into a bowl for your furry friend. How smart! I hope other brands take note and provide similar Foursquare-enabled freebies in real life. Digital advertising has given billboards a whole new life.